Enter the Realm of the Incarnations. Face the very essence of Anguish, Pride, Hope & Despair. Take up sword against all four Horsemen of the Apocalypse - including Death himself. If Fortune is by your side, you may just come out alive - and wealthy beyond imagining. Welcome back to Cutthroat Caverns. 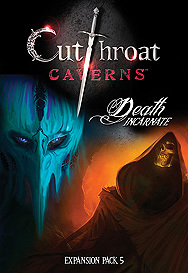 Death incarnate is an expansion dedicated to the most feared Encounters in the game, the Incarnation. Here their numbers are more than doubled, new Events are themed for their spheres of influence & legendary Relics are imbued with their incredible powers - one for each incarnation since you first braved the caverns. Embark on a Quest and see if you are cutthroat enough to become its very Incarnation. This set has it all. This is an expansion. The core set is required to play.